The King of Chinese Pop is set to wow his Malaysian fans on 16 March 2019. Set to take place at 8pm in Stadium Merdeka, Leehom's concert will feature the production team from the Grammys to allow fans to experience a "journey into the future". Presented by MIA, organised by Unusual Entertainment and Star Planet as the supporting partner, the Malaysian leg of the tour will include a unique stage in the form of a spaceship, coupled with LED lighting, holograms, animated movies, and choreography. 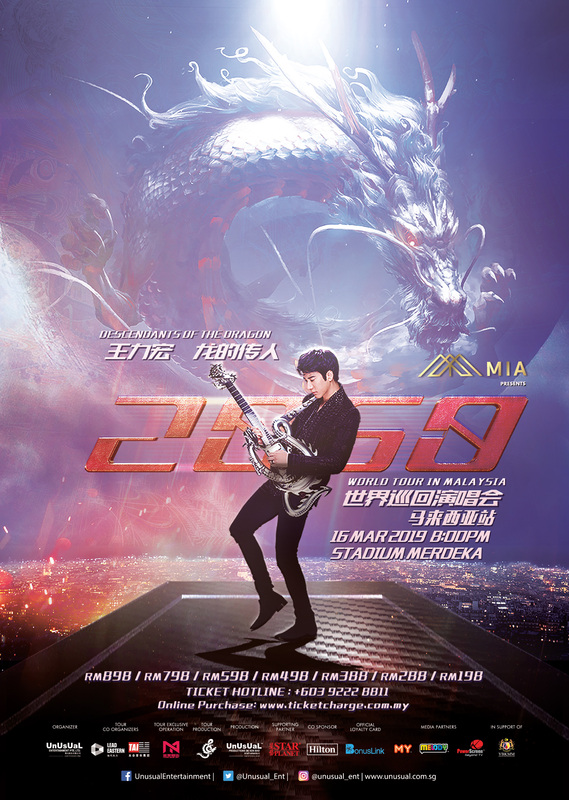 Leehom's return to Malaysia comes five years after his last concert in 2014. Leehom has made a name for himself over the years by combining elements of traditional Chinese instruments with genres such as Pop and R&B. His biggest hits include 'Forever Love', 'Only One (唯一)', 'All The Things You Never Knew ﻿(你不知道的事)', and more. Born in the Year of the Dragon himself, 43-year-old Leehom vowed to perform a brand new version of his 2000 hit 'Descendants of the Dragon' every time the Year of the Dragon rolls around. He also aims to do so until the year 2060. According to Leehom, the tour, which represents the future of Chinese ethnicity and tradition, will also introduce his fans to a new world of love, peace, and equality. From 19 to 21 January, a 10% discount will be extended to buyers of VVIP, VIP, Cat , Cat 2, and Cat 3 tickets. Each transaction is limited to eight tickets only. VIP ticket purchasers to receive a concert poster personally autographed by Leehom. For more information on the show, you may reach Ticket Charge at 03-92228811 or check out Unusual Entertainment's website here. Fiji Water Girl was out there living her best life.